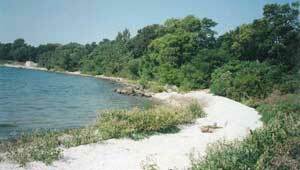 Middle Bass Island in Lake Erie is home to a new nature preserve. The 7.8-acre island property—with extensive migratory bird habitat and a large population of the Lake Erie watersnake—was threatened with development for residential and vacation homes. The Trust for Public Land spearheaded the acquisition of the property, working closely with the Black Swamp Conservancy and its Lake Erie Islands Chapter and the Put-in-Bay Township Park District. The park district owns the land and will manage the property as a nature preserve and kayak park. The preserve is not yet open to the public. Access will be allowed after areas of the site have been restored and recreation improvements completed. Funding for the purchase included $844,000 from the Clean Ohio Fund, $70,000 from the state Land and Water Conservation Fund, and $70,000 from the Ohio Department of Natural Resources Coastal Management Assistance Grant program. Additional financial support was provided by the Lake Erie Protection Fund, Ohio Ornithological Society, Frost-Parker Foundation of Sandusky, Friends of Magee Marsh, Firelands Audubon, and many private donors.